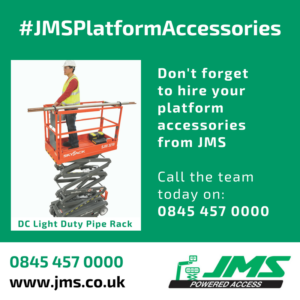 When hiring powered access from JMS, don’t forget that you can hire platform accessories too. 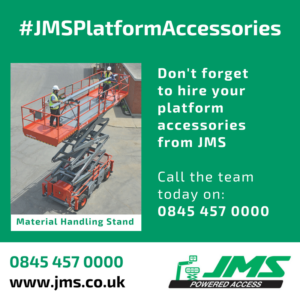 Platform accessories available from JMS range from tyre covers to material handling stands. 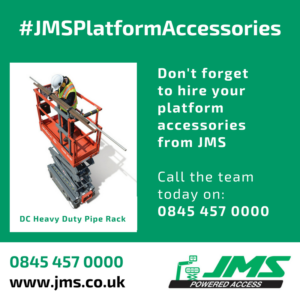 These accessories will support safe use of the powered access machines hired from JMS. 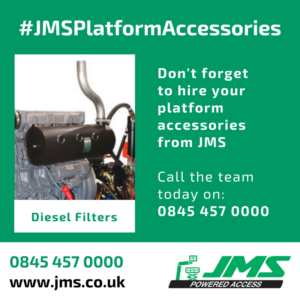 Remove fumes with diesel filters – these can be fitted to most cherry pickers and scissor lifts at the JMS fleet. The key benefit of diesel filters is that they considerably remove exhaust irritants, hydrocarbons and carbon monoxide. The diesel filters are useful if you are using a diesel machine in indoor applications or confined spaces. Keep clean and carry on. 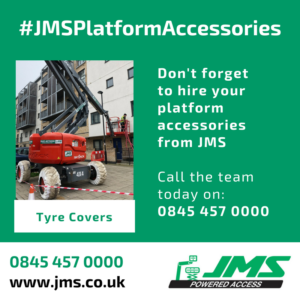 You can hire tyre covers from JMS. Avoid marking floors with our protective range of tyre covers. Strong and sturdy like a football team in the world cup. The heavy-duty pipe rack is designed for durability and sturdiness. Ideal for HVAC, plumbing and fire sprinkler installation, the heavy duty pipe rack is designed for durability and sturdiness. Handling made easy peasy. 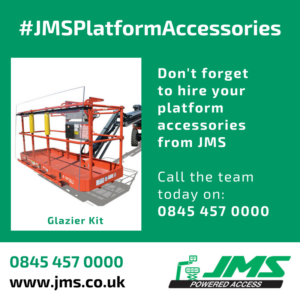 The glazier kit has been designed to help provide easy handling and reduced manual work for carrying material to height. Keep it simple with JMS. How many contractors did it take to change a lightbulb? 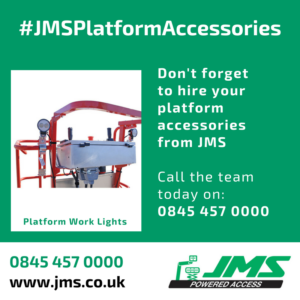 We can’t answer that but, don’t forget Platform Work Lights are available as a platform accessory from JMS. The platform work light option includes two LED lights, making it ideal for applications involving low light conditions. You’ve heard of the phrase a tidy desk gives you a tidy mind. Now operators can get organised and productive with JMS. Safe handling made easy. Now that’s a good idea. Safety first. The material handling stand gives a safe, secure, and productive solution for transportation and material installation. Deliver more, in less space. Carry pipes at height with ease without sacrificing work space. 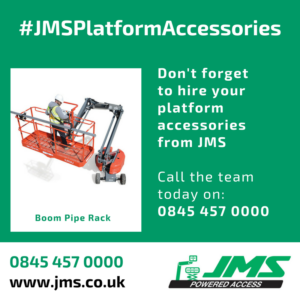 Boom Pipe Racks available to hire from JMS. 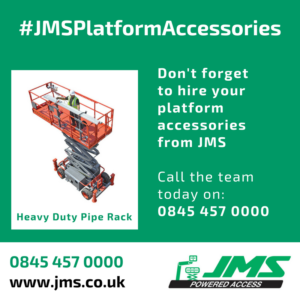 We like to deliver more than expected at JMS, get in touch with our team for more information about platform accessories. They are fragile and can break if not handled properly. The fluorescent tube carrier features a rubber padded base designed to provide a soft resting spot, and is equipped with a buckle strap to secure and safely carry the fluorescent lights to their work location. 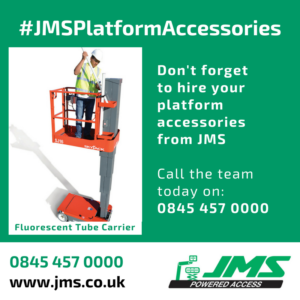 Ideal for maintenance needs, the fluorescent tube carrier is mounted outside the platform to optimise work space and increase productivity. 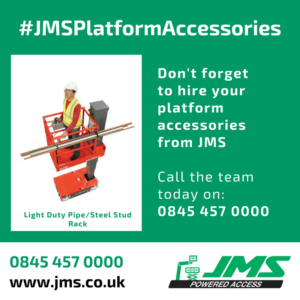 All platform accessories and powered access machines are available nationally to hire through JMS’s depots in Harpenden, Hertfordshire, Leeds, West Yorkshire, Pinewood studios and Radlett.